I sat down with Bopha Malone recently to find out what it means to be a leader, how she holds on to a culture she was torn from at a young age, and what it takes to build a bridge of culture and community from one end of the world to another. Entrepreneur, Attorney, Author, Blogger, and Mom. "Don't take the straight path or the winding path. Take the path your ancestors have taken." -Cambodian Proverb. Bopha Malone was born in Phnom Penh, the capital of Cambodia, shortly after the fall of the Khmer Rouge. Her first childhood memories are of fleeing her country, at three years old, through the jungle in the arms of her mother who tried desperately to stop her crying for fear that they would be killed. Bopha and her mom would soon make it to refuge in Thailand where her father and brother were anxiously waiting to receive them. Bopha and her family lived in a Thailand refugee camp for six years until they were sponsored to come to America. 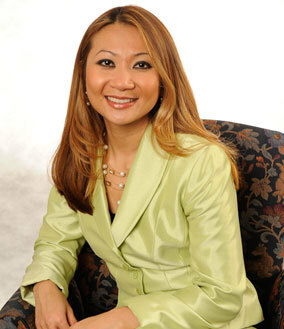 Her family came to the United States in 1989 and settled in Pennsylvania where there were very few Cambodian families in in the area. Bopha recalled that nobody in her family spoke English and that the only work her dad could find was in New York City. He would work all week long in the city and then return home on the weekends to be with his family. After one year, the family moved to Lynn, Massachusetts, where there were people they knew, jobs, and other people from their culture. Bopha learned English quickly and immersed herself into school. Despite financial constraints, she went on to graduate from Lesley University, then went on to get her Master's Degree, and to start a family of her own, all while making a name for herself in the banking industry and as a community leader. Bopha says that she is the byproduct of a mom and dad who understood the meaning of hard work, sacrifice and perseverance. She eventually moved back to Cambodia for one year, immersing herself in the culture and history from which she had been born. The highly successful community leader hasn't taken the straight nor winding path, but rather has followed the path shaped for her by her parents who survived the frightening tenure of the Khmer Rouge, eventually moving the family to safer ground, while instilling in Bopha and her siblings, simple yet profound lessons on happiness, leadership, and sacrifice. We Are All Rich Beyond Measure: Growing up, Bopha says that her family didn't have much money so she didn't have all the designer clothes and material things that other kids in her school had. However, she says that her parents instilled in her a sense of gratitude for all the blessings they did have, like a home in the United States. Today, Bopha tries to instill this same sense of gratitude in her own young children. One of her favorite books is Three Cups: A Lesson In Life and Money for Children. Through this book, Bopha and her husband have been teaching their kids the importance of earning money and then putting their income into each of the 3 cups; savings, giving, and spending. She says that she always feels as though she's walking a fine line. On the one hand, she wants her kids to have the things in life that she couldn't have as a child. On the other, she realizes that the very fiber of her own being was built on a foundation of gratitude for non-material riches. Bopha says that for her family, Three Cups is a step in the right direction. It starts the conversation about money, blessings, and our responsibility to help others. Since Three Cups has become part of her household, the conversations each month about allowance money has gone from how the kids will spend their earnings on themselves, to how they can save and who they can help with their hard earned money. See Yourself Through Others: While in high school, Bopha inadvertently came across a non-profit organization called Girls Inc., a non-profit organization that focuses on giving confidence to girls. Bopha says that her involvement in this organization forever changed the trajectory of her life. She says that she would not be where she is today without Girls Inc. When Bopha was in high school, her sole focus was on graduating and then immediately getting a job so that she could contribute to her family financially. She grew up in a culture where women weren't seen as leaders, but rather they were seen as home makers, and so the thought of going to college never even crossed Bopha's mind. Girls Inc. opened her eyes to possibility. She got to see and meet women who were community and business leaders. Even then, Bopha didn't believe she could ever afford college, but her friends and mentors at Girls Inc. pushed her to research student loans and scholarships. Bopha credits Girls Inc. with helping her see a totally different future for herself, one that was absolutely within her grasp. Bopha went on to graduate from Lesley University in Cambridge, MA. It was in Cambridge where she met her future husband, Tom, while he was attending Harvard. Bopha says that her college education, her commitment to her culture and her community, and even her family, are all byproducts of a lucky brush with fate that brought her to the door of Girls Inc. as a young and impressionable girl. Culture: Even though Bopha lived the first few years of her life in Cambodia and spent her entire life within a Cambodian household, she said that she grew up thirsty for knowledge about her culture and her ancestors. She said that it's not unusual for people who grew up living under the death, destruction, and suppression of the Khmer Rouge, to never speak of it again with family. Such was the case with her own family, where her parents never wanted to bring the bad parts of their lives into their new home in America. Bopha says that the downside to this is that she also never really knew about the good parts of her culture either, and she said that there comes a certain point in your life where you need and want to know about where you came from. Thanks again to the help of Girls Inc., Bopha wrote a grant proposal to an organization with whom she partnered, so that she could spend a year in Cambodia. With the help of strangers, Bopha raised $10,000, and she travelled to Cambodia to absorb her culture. She was so grateful to the people who donated to her trip that each month she would send an email report to the group, letting them know what she had discovered, and at the end of the year she compiled an Annual Report, documenting the entire trip and what she had learned. When it came time for Bopha to start looking for a job in America, she emailed this same group, to see if anyone had ideas on what type of work she should seek based on her skill level. One of her supporters, a woman by the name of Carol Duncan, was on that email string. She was, at that time, the Executive Director of Girls, Inc. of Lowell, and she and her husband, George, had donated to Bopha's trip. Carol gave the email to her husband, who reached out to Bopha for a meeting. George was the founder of Enterprise Bank, a community bank based out of Lowell, Massachusetts. Bopha has now been an emerging leader within Enterprise Bank for more than a decade, and she credits her continued success to the mentorship of George Duncan who supported her even before he knew her, and who has, to this day, remained a valuable advisor, friend, and advocate. Be A Guiding Light: Bopha says that what she's proudest of in her life and career is that she has been able to be a guiding light to others. As a Regional Business Advisor at Enterprise Bank she helps businesses develop and thrive. She says that her reward is when she drives through a city and sees a prospering business that she helped, because she knows that behind the walls of that business there are countless families who are positively impacted by that enterprise. Bopha has also become a guiding light to multiple charitable organizations. She is the President of the Cambodian Mutual Assistance Association and is a board member of Girls, Inc. of Greater Lowell. She also volunteers for Women Working Wonders, the Board of Governors of Lowell General Hospital, the City of Lowell Smith Baker Center, and is a Trustee of Middlesex Community College. Bopha says that she lives a blessed life thanks to her mom and dad who figured out a way to America, and thanks too to friends, mentors, non-profits, and complete strangers who reached out and guided her in the right direction when she wasn't sure which way to go. She says it's her mission now to offer the same type of guidance to others. Bopha Malone is a community leader, a banker, a philanthropist, a wife, and a mom. And, just like the Cambodian Proverb suggested, she hasn't taken the straight path, nor the winding one. She followed a path that many before her helped pave, and Bopha now continues to lay the ground for others who may also seek guidance in finding their own way to success.